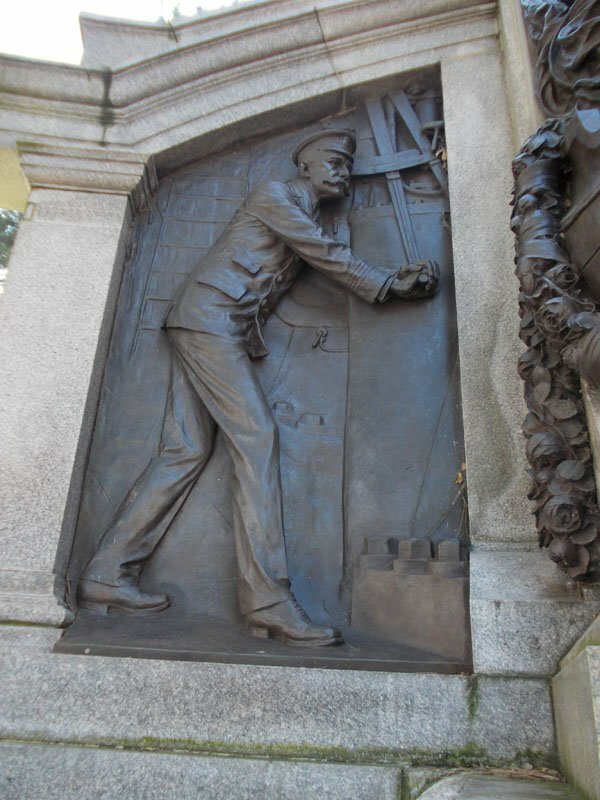 Wayne Ranger's grandfather modelled as one of the engineers on the famous Titanic memorial in East Park, Southampton. My grandfather - Frederick Wm Hatfield (1878 – 1954) was chosen to model for the memorial probably because he was a greaser and stoker on other White Star sister vessels. 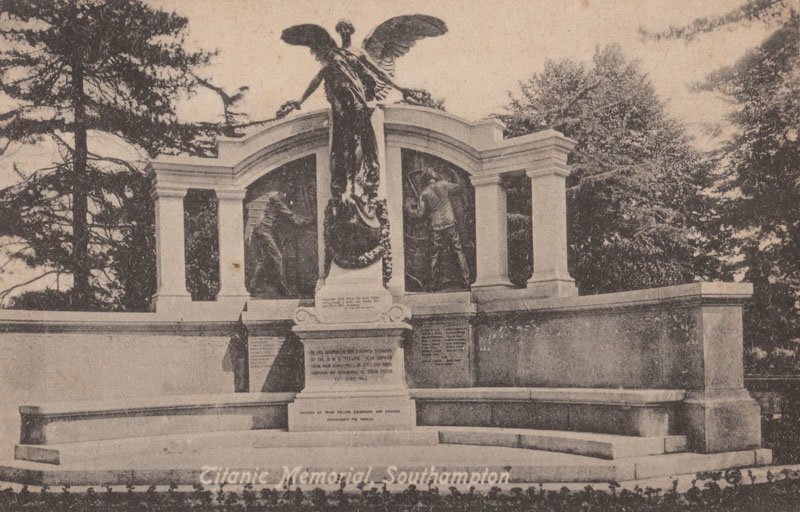 But being Southampton born was important – scarcely a single street in Southampton was not affected by the loss of the Titanic. He was known on his merchant records and to his family as Bill – and a distinguishing feature of “an eagle on forearm”. He probably had to travel to London where the project was executed under Joseph James Whitbread at Kennington. Constructed in granite and bronze the central figure is Nike the Goddess of Victory and not an angel as many surmise – she stands on the prow of a ship and represents “victory over death” – a theme of many memorials Some descriptions say she is “Victoria” - equally valid. The original statue of the truly beautiful Nike figure is the work of Romeo Ratman from Trieste - the Kennington area attracted many Italian masons and artists – the chief sculptor for the project was Ferdinand Victor Blundstone. 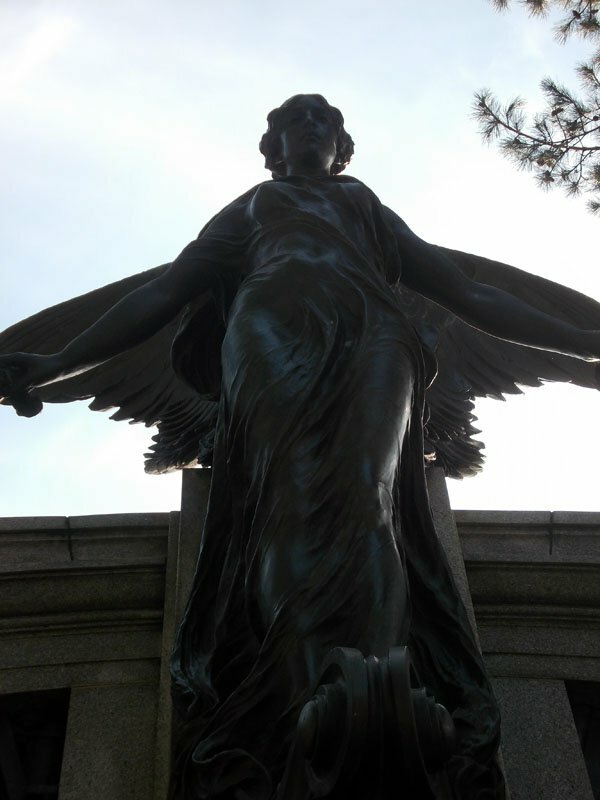 Similar if not identical statues are seen on important memorials everywhere. 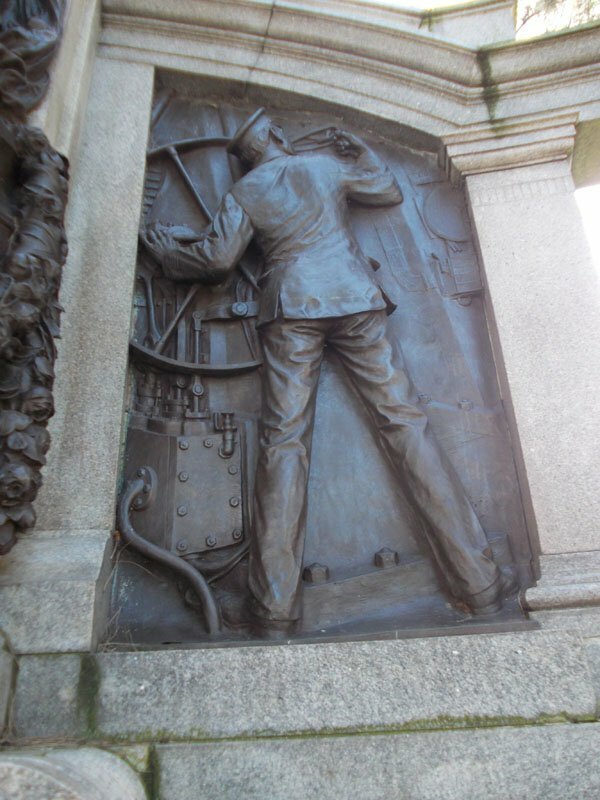 In these more egalitarian times the memorial would have been dedicated to all the below decks crew - not just the Engineering Officers. The “black gang” of greasers, stokers and firemen as well as electricians and others were well below the water line as they toiled away in the most dreadful conditions. Bill Hatfield was not on the Titanic but the other side of my family was represented by crew survivor Thomas Ranger who made an undignified exit through the dummy funnel to Lifeboat 4 and thence to the Carpathia and had much to say at the London Inquiry. By a stroke of supreme irony Bill was a stoker (4 years after modelling the Memorial!) on the HMHS Britannic when it was sunk off Kea in the Aegean Sea - Nov 21st 1916 – despite the large red cross on each side. There were at least 3 Titanic survivors on board Britannic cursing their luck again including Titanic stewardess Violet Jessop. Bill disappeared for some considerable time in the mayhem that ensued after the sinking and appeared on his wife’s doorstep in Southampton only much later - with just the clothes he stood up in. Whether he had followed the officially recorded repatriation route to Marseilles and Le Havre is not clear – but he did have some stories to tell. He recalled that “the decks were jam packed with stretchers”. He went on to join even more White Star vessels and eventually the Queen Mary and Empress of France on the transatlantic run, but even there his luck was running out, when he was found to be working a scam (as we now call it) on the crews’ football pools. He was a drinker smoker and gambler all his life – he would go home - get drunk – let the parrot out and father a child before returning to sea. He seems to have left the sea after more than 50 years around 1947 and died in 1954 with a full head of wavy hair – look at the East Park Memorial! 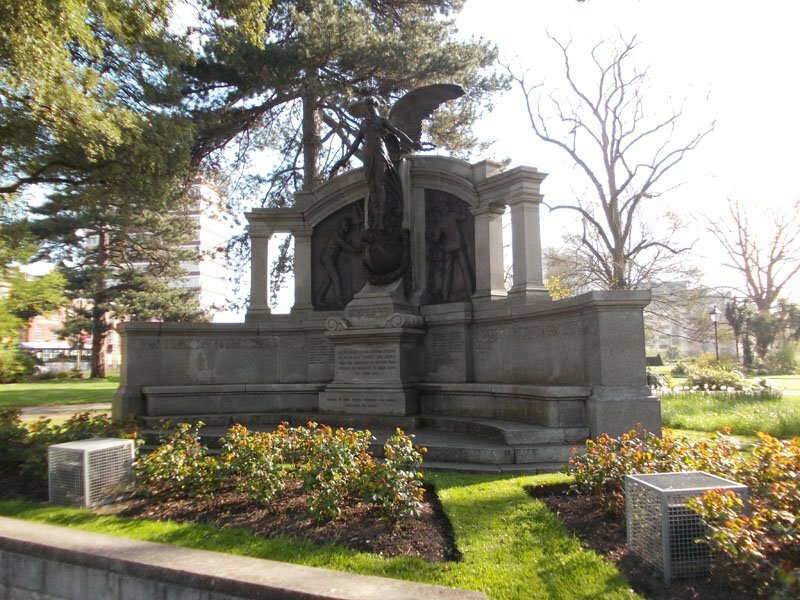 As a footnote to the East Park Memorial there is a related memorial in Liverpool which was conceived as a Titanic memorial – however by the time it was constructed the war losses were mounting and so it was re branded as a memorial to all Merchant Seamen who perished at sea in WW1.